According to the show The Secret life Of... the deviled egg originated in ancient Rome. It is still popular across the continent of Europe. In France it is called ceuf mimosa, in the Netherlands “stuffed egg”. In Belgium, Netherlands and Germany sometimes a variation is served known as “Russian eggs”, where the eggs are filled with caviar. Deviled eggs are a common dish in the USA. In the Midwestern and Southern USA, they are commonly served as horsd'oeuvres before a full meal is served, often during the summer months. Deviled eggs are so popular in the USA that special carrying trays are sold for them. Prepared and packaged deviled eggs are now available in some USA supermarkets. The term “deviled” in reference to food, was in use in the 18th century, with the first known print reference appearing in 1786. In the 19th century, it came to be used most often with spicy or zesty food, including eggs prepared with mustard, pepper or other ingredients stuffed in the yolk cavity. In some parts of the Southern and Midwestern USA, the term “salad eggs” or “dressed eggs” are used, particularly when the dish is served in connection with a church function, persumably to avoid dignifying the word “deviled”. Cut eggs in half. Remove yolk and add to a bowl. Using a fork, mash yolk. Stir in light mayo, salt, pepper, cumin, paprika and green onions. Stir well. Fill egg whites with yolk mixture. Garnish with green onions. Place eggs in a container, cover and chill until ready to serve. Enjoy! I love all the variations on deviled eggs. I like this recipe but tend to give mine a little more kick with cayenne. Thants for the history on deviled eggs. I never thought about putting cumin in it. I may have to try yours and see how it goes. I like that these are more savory than sweet. The version with the sweet pickes & juice is the only one I have tried. Thanks for sharing. Ooooo, nice touch with the cumin! I love deviled eggs although I have never made them! These look super good. Great twist on the deviled egg! I like the southwest flavors! Haven't had deviled eggs in years. I'd love to try them again - esp with that cumin in there. Sounds super. Once I saw you had written a recipe for deviled eggs, I just had pay you a visit! I'm a deviled egg fiend and actually collect recipes. It's amazing how many variations there are. I'll give your recipe a try as well. I heard this before but never try before , one day I must this. Love the eggs! I am such a deviled egg freak haha...they are so delicious! I like the cumin in this and will try it the next time we have deviled eggs. Will also share this with my daughter in law who is the deviled egg queen. My family loves deviled eggs too. If you try this, let me know what you think. I think you will like this version of deviled eggs. Taste great. I think y'all will like this. They came out great. Thank you, Sandra. Thank you to all. You and your comments mean the world to me. My girls love chopped hard-boiled eggs with mayo in their sandwiches/buns and bcoz it's so simple & easy to make, it gradually became a must-have snack for any of our outings/gatherings. I've always wanted to try the deviled eggs but bcoz it's spicy (the kiddos can't really take spicy food), I didn't try making. What other seasonings would you recommend to make a non-spicy version of the deviled eggs? Hi! Other seasonings you could use, minced dill pickle, sweet pickle relish, minced celery, chopped parsley, dill. Thank you so much for your suggestions, Christine! Oh wow! 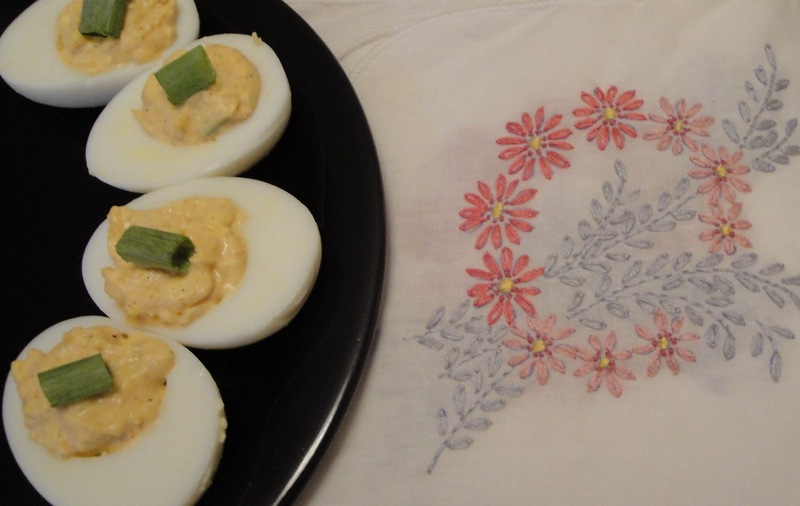 I <3 these deviled eggs, simple and flavorful!Yum! You're welcome. I'm happy to help. Have a great week. I have yet to make eggs this way- thanks for the recipe! Who doesn't like a deviled egg?! I don't think I've heard anyone say they didn't like deviled eggs. We have Indian versions of devilled eggs, but loved this. I am bookmarking this definitely. Christine, thanks for such a wonderful recipe! Nice and simple Christine but you know what, over here we have a curry called devilled which we make during festivals and its killer hot. Deviled eggs are a perfect food. This is exactly how my mom used to make them, and they were awesome! I looooove deviled eggs!!! Never made them myself though. Thanks for this Christine! Would love to have these deviled eggs at breakfast! As a non American woman, I must thank you for sharing the info about the term. Thank you very much. When you try this, let me know what you think. I love to hear any feedback. We love deviled eggs. I never knew that originally, the use of the term deviled indicated spiciness. Cool! Yum I haven't made devilled eggs for ever! I'm really craving them now especially with the cumin!! They look delicious. The flavours sound interesting. BTW, loved the embroidery :-) It reminded me of my Mom. Years ago my grandmother did the embroidery. Thanks! I love the addition of cumin. My sister is the deviled egg queen and has one of those fancy carriers, I will pass this recipe to her. Thanks for sharing. Very nice. You made the top 9 for this one too, right? Congrats. No, this recipe didn't make top 9. Hi Christine, I love your recipe. I'm not a fan of people adding too many things to eggs and yours are just perfect. Can't wait to try them, yummy! Thanks for participating in September's YBR :) Sorry I'm so late in getting here.